Make mention that His name is exalted." 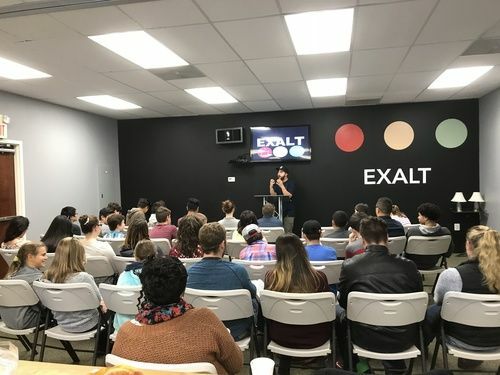 Why: We exist to Equip the Youth to Follow Jesus and EXALT Him in their everyday Lives. What: We Have times of Study in the Word, Table Talks where we discuss the Word of God as a Community, We have times of Prayer and Worship to Be with Jesus and to allow Him to Speak to us Personally and Corporately, and We have Opportunities to Go into our Communities and to EXALT Jesus wherever We Go. 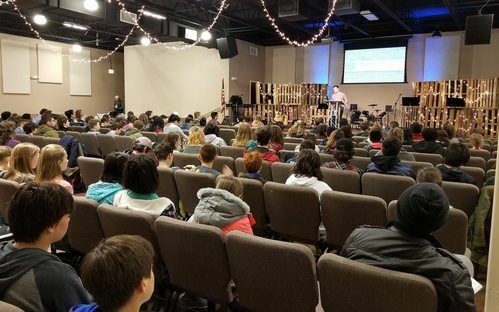 BELIEVE THAT THE YOUTH IS NOT THE CHURCH OF TOMORROW BUT THE CHURCH OF TODAY AND THAT GOD IS USING AND WILL USE OUR STUDENTS TO BRING HIM GLORY! WE ARE CONVINCED THAT AS WE TEACH THE SAME AS THE SENIOR PASTOR IS, THAT IT WILL BETTER CONNECT FAMILIES AND THE BODY WITH INTENTIONAL FELLOWSHIP ABOUT THE WORD AND THE SEASON OUR CHURCH IS IN. WE COME TOGETHER FOR MIDWEEK GROUP FOR A NIGHT OF WORSHIP,COMMUNITY, AND DISCIPLESHIP. AS WE SEPARATE THE AGES, WE TRUST THAT GOD WILL ALLOW US TO INTENTIONALLY INVEST IN EACH GROUP OF STUDENTS IN THE PLACES THAT THEY ARE AT. WE BEING THE MONTH WITH A DECLARE NIGHT, AS WE TEACH THROUGH THE WORD OF GOD. THE REST OF THE MONTH WE ENJOY DISCUSSION FROM THE PASSAGE IN A TIME AROUND OUR COMMUNITY TABLES THA T WE CALL “TABLE TALKS”. THIS IS A WAY TO CONNECT WITH ONE ANOTHER BUT ALSO TO DISCIPLE AND ENCOURAGE ONE ANOTHER IN CHRIST. WEDNESDAY 7PM IS OUR MIDDLE AND HIGH SCHOOL NIGHT DURING THE MIDWEEK SERVICE.